Do you have a son or daughter who is away at college or university this semester? What will get them to think of you when they are studying so hard that there is no time to think of anything but books. Cookies, right? They will remember the times they had fresh, warm-from-the-oven, oatmeal raisin cookies. Make lots and lots of them and send them regularly with a note to call home for more. So how do I cope with my lonely heart and depression? Baking, of course. There isn’t much that the smell of hot cookies can’t cure. I would have never made these when my college boy was home because he despises raisins. Wait….um, I think I just discovered the first positive aspect of him being gone. All the raisins, chocolate and carbonated beverages our family wants without worrying about getting the stink-eye from him. In the bowl of your mixer with the paddle attachment, beat together the butter and both sugars until light and fluffy, about 5 minutes. Add the eggs one at a time and then scrape down the sides of the bowl before adding the salt, baking powder and nutmeg to mix in. Add the oats, flour and raisins and them mix on low until it all comes together. Using a cookie scoop, portion out the dough onto an ungreased cookie sheet and bake for 12-14 minutes until the edges are set but the centers are still soft. You want to them seem like they need a couple minutes longer in the oven when you pull them out or they will overcook! 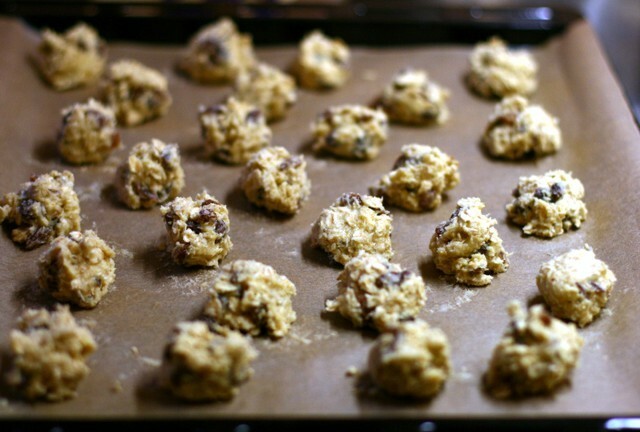 Allow them to rest on the cookie sheet for 5 minutes before removing them to cool completely. And what about your empty nest? Do you have lots of time to read all those books you’ve got on the shelf now that your young loved ones are far away. If that is what you are doing to I cope with your lonely heart, get baking instead. There isn’t much that the smell of hot cookies can’t cure. Be sure to read the whole recipe for this comfy food.